Splats circus workshops are suitable for Nursery to adults as what and how we teach is made age appropriate. We can teach up to 35 (more on request) in a formal class and more if it is an open style workshop. Depending on the size of the event and what you requirements are we can be flexible to your needs. Splats Circus Workshop is perfect for all ages and abilities and is a great way to bring communities to gether. Everyone will challenge their perceptions, teach and observe each other and work as a group to achieve success. Learning and playing at their own level to improve co-ordination, confidence and understanding of how anything is achievable. Depending on the structure of your day, workshop our Splats circus workshop leader will start with a demonstration show. Our Splats expert amazes and educates with a little help from the participants who will soon become teachers themselves. Here are all the circus skills we teach. Our lessons start with scarf juggling. They move so slowly they are a great way for young children to learn to catch and older to learn the juggling pattern. Slow and floaty for movement and creativity. One of our favourite challenges is the feather balance. On one finger, the hand, back of the arm and eventually on the nose, chin or head. The Splats circus skills learning to learn key skill. Juggling is the perfect learning model. Our plate spinning challenge works for all ages, from spinning on the finger to spinning from the stick and then balancing it on the chin. Gentle relaxed movement leads to success. Coordinate both sides of the body and brain. Great for the older end of primary and secondary. Great rhythm challenge teaching delicacy of touch and timing. Rolling, flicking, throwing and catching. We then teach spinning, throwing and catching of a diabolo plus for the expert some more fancy tricks. Stilts is great for learning the basics of balance, having a race with others and more. We then teach balancing, standing and walking. Challenge the bravery and skill of the pupils. Pedal Go is an easy to learn and safe balancing prop which makes it perfect for kids. It’s great for learning the basics of balance, having a race with others and more. Circus daring in slow motion. A Splats circus workshop favourite is to run session for families. During our circus skills day at schools we can run a free family workshop so the pupils can teach their parents what they have learned and everyone benefits. Visit our shop for a full range of circus workshop equipment and school/community packs so you can continue teaching circus in school. Often the groups we teach would like to continue learning after the day. Our aim is for you to be able to teach the skills we present after we leave. To help this we have teaching guides, project materials a teaching book and lesson plans and videos all available to anyone who books a day. We can provide training for the teachers and provide unlimited advice and support on teaching. Splats Circus workshops and days are available UK wide. We do not charge for travel. All our teachers carry DBS checks and we have full public liability insurance. 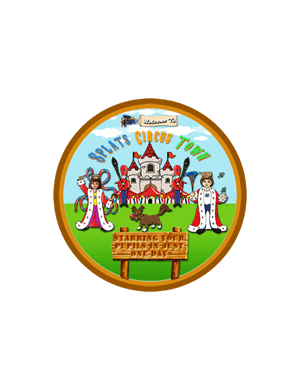 If you have 4 classes or less we can even put on the Splats Circus Town show performed by the participants at the end of the workshop. Great fun and inspiring. For bookings and prices for a Circus Workshop and all our other days and plays please visit our shop. Also please do drop us a line as circus workshops often very greatly in requirements and we will be able to adapt for your needs. You can book/reserve a date here with no payment required as we will need to confirm availability. We can then send you an invoice and booking letter. Everyone will challenge their perceptions, teach and observe each other and work as a group to achieve success. Learning and Playing at their own level to improve co-ordination, confidence and understanding of how anything is achievable. We travel across mainland Britain. It is always one Splats artist per session of up to 35 pupils. Please talk to us if you have more pupils. We need a sound system and although not essential access to any lighting or staging you have. What time do you arrive and how long to set up? 30 minutes before we start and it takes 15 minutes to set up. Do you need the hall? We do need the hall all day except for lunch, although we can work in a large class room for some of the time. How many members of our staff do you need? We need the staff ratio that you would normally have plus our Splats teacher. Your staff will be responsible for the pupils tertiary care. Only for circus days but in wind and rain it becomes very difficult. Yes we have full public liability. Do you provide confidence and team building? Yes we have a modual in all workshops for team building , exploring self confidence, learning techniques and self perceptions of learning. Yes we often teach adults for team building sessions and Inset training. Do you send a booking letter? Yes you should receive an email within 24 hours of booking. You need to check all the details . When you are ready fill in the timetable and send it back to the email address. There will be an invoice sent to your email address please pass this onto the bursar/accounts department/treasurer/local authority or whoever is in charge of payments. They can contact us if they need to make specific payment arrangements. No there is no extra travel on mainland Britain. Can we have a multiple booking discount? Yes see our booking form or drop us a line. If you send us your ideal date range we will do our best to fit you in. Visit our shop for a full range of circus equipment and school and workshop packs so you can continue teaching circus in school or in your community.